As part of their test, the students had to demonstrate Siu Lim Tao 小念頭. On the demonstration some students were very nervous, some was confident. After their demonstration Grandmaster Ip Chun 葉準 gave them some comments. He told them, “Your Siu Lim Tao is not too bad after a week of learning, and I am happy about it. However, some of you are not keeping a straight back and are leaning backwards too much, like the Leaning Tower of Pisa in Italy. 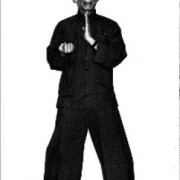 Your back needs to be straight, otherwise your Wing Chun will not be good.” Grandmaster continue to explain the correct position in Siu Lim Tao and said, “The outside edge of your shoulders should be in a vertical line down to the back of your heels. This is how you make the posture in Yìh Jih Kìhm Yèuhng Máh 二字鉗羊馬. 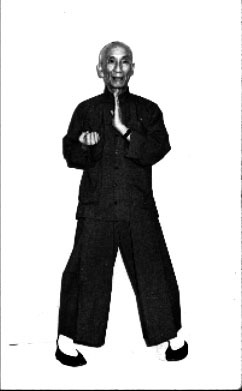 You must remember to check your posture when you practice Siu Lim Tao.” All the students were happy to hear these comments. The next group had come to test their Tsum Kìuh 尋橋. They demonstrated their form in front of Grandmaster Ip Chun. Some of them forgot some of the movements, and I thought they must be very nervous. However after they saw some of the others do the form they remembered and continued. At the end they all finished their Tsum Kiu form.